Sign the petition demanding a full investigation into Tickles' demise. On February 24, it became public that nearly two weeks ago, a carriage horse named Tickles was killed after what the abusive industry described as a "mysterious leg injury." He was just laying in his stall, mysteriously broke his leg, and needed to be put down. Hmmmmm. Does that sound shady to you? Horses do not just break their legs without incident. So we want to know: how did it happen and why did Tickles need to be euthanized? And why are we only finding out about it nearly two weeks later? The city must conduct a thorough investigation and necropsy of the horse. 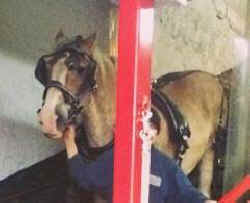 The investigation needs to be independent, with a vet who isn't paid by the carriage industry. We need to know the truth about how Tickles was treated and what happened. Why didn't the stable owner take the horse directly to an emergency vet? How long did the horse have to wait in pain and what treatment did they attempt before killing the horse? Did Tickles have a history of other health problems? And as residents of New York, we need to know: did the inhumane treatment of carriage horses play a role in Tickles' death?